Certainly Ge’ez was the language Moses spoke with God. But for strange reasons the world doesn’t want to look at the Abyssinia Hypothesis. The Arab Yemeni Israelite took refuge in Abyssinia for 430 years all their traditions and culture became Ethiopian. So their tales came from that environment and not from anywhere else. The Israelite and the Hebrew were Arab Yemeni. Early Jews and Modern Jews are Turkic Mongolians mixed with Asian and European slaves. Egyptian and Hebrew cultures NEVER borrowed from each other and there was no way to accommodate large nomadic herding people in Egypt, and they left no graves neither in Egypt nor in Sinai, and they hadn’t seen the Pyramids or knew any Egyptian king. The Israelite were never enslaved, they abused the hospitality of Africans and enslaved Ethiopians, Eritrean, Nubians (Kerma), and other Sudanese. That is why they were expelled then fled in the Biblical Exodus of 1446 BC. Egypt have no records of nomadic Israelite. 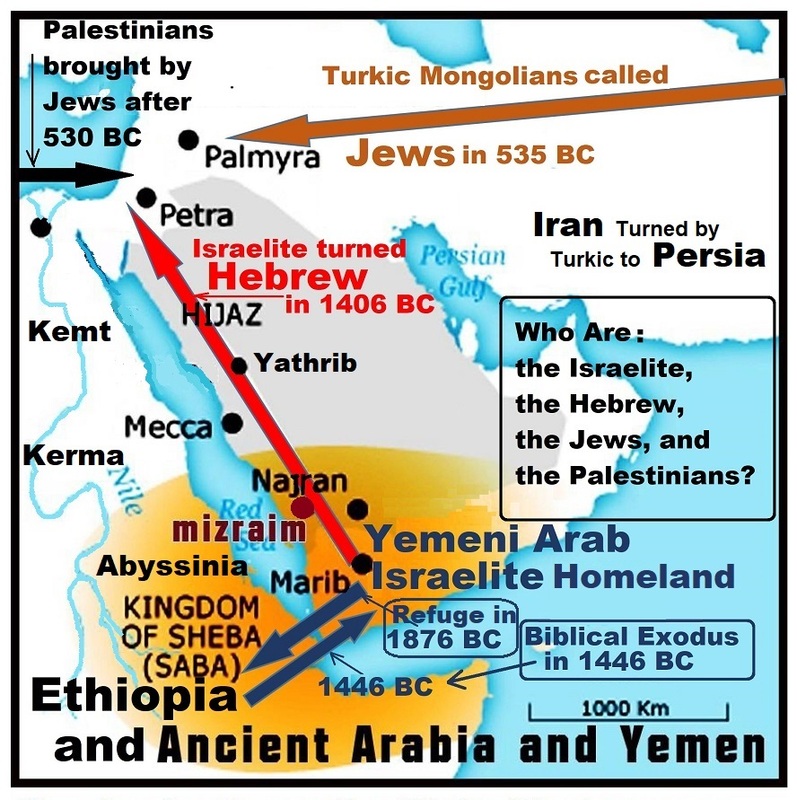 Hebrew were created after the Arab Yemeni Israelite invaded and colonized Canaan in 1406 BC. Moses and even Abraham never went to Egypt, they went to Abyssinia only, so they spoke Ge’ez with God. And even after the Exodus they used Ge’ez back in Yemen and not Yemeni, which was close to Ge’ez. The Ten Commandments were written in Ge’ez, not in Yemeni or in Hebrew (which was not yet developed), nor Egyptian. I wonder what kind of prejudice that blinds scholars, academia, and the public? Moses, Abraham, and the Israelite were not in Egypt, Mesopotamia, or any other place. It is quite clear that the conventional Egypt Hypothesis as well as the alternative Arabia Only Hypothesis are both illogical and cannot be scientifically proven. The Abyssinia Hypothesis is certainly the only way to discover the true history of Israel, Jews, and Judaism. There are numerous contradictions in the Hebrew Bible that defy any logic and science. For example mentioning camels, while they were never brought to Egypt before the Persian invasion of Egypt in 525 BC. They only existed in East Africa, and not even in Arabia. Christianity was turned into Judaeo-Christianity first by Paul then by Turkic Jewish migration into Rome which resulted in the collapse of the Roman Empire. Judaism was invented by Turkic Mongolians who created Persia. First the Arab Yemeni Israelite and Hebrew started the changing the scriptures, then came the Jews and completed the job. Egypt didn’t influence or borrowed from Israelites and Jews. The only link between the religion of Egypt and Israelite is that Amenhotep IV “Akhenaten” (1353–1336 BC) heard about Abraham and tried to unify the faith of Egypt, but that was a failure and short-lived. It is very wise to point to two extremes. Some ignorant or dishonest people want the world either to take nonsense or to believe in nothing. Believers must discover the truth and avoid crafty denial of faith. The strange reason, or at least one of the reasons, is that Christian Zionists and Fundamentalist Christians (Protestants) cannot allow in their thinking even the possibility that any single verse in the Bible is other than literally true. For them, there are no allegorical passages, and the universe was created in 6 days, some individuals lived for several hundreds of years, etc. At the other end of the spectrum are those who refer to the Old Testament as “the imagined history of the Jewish people” (as the late American, Joseph Campbell (1904 – 1987) did in one of his books). There are numerous contradictions in the Hebrew Bible that defeat any logic and science. For example mentioning camels, while they were never brought to Egypt before the Persian invasion. They only existed in East Africa, not even in Arabia. Christianity was defeated first by Paul then by Turkic Jewish migration into Rome which resulted in the collapse of the Roman Empire. Judaism was invented by Turkic Mongolians who created Persia. First the Arab Yemeni Israelite and Hebrew started the forgery, then came the Jews and completed the job. Egypt didn’t influence or borrowed from Israelites and Jews. The only link is that Ikhnaton heard about Abraham and tried to unify the faith of Egypt, but that was a failure and short-lived. If you say Christianity was defeated by Paul then what was the original Christianity (before he came along)? The Christianity of Jesus was about faith, truth, love, and God. Paul turned it to be a cult about Jesus, Jews, and emperors. Interesting enough is that the Egyptians recorded the Minoan eruption which occurred between 1642–1540 BC, while the Israelite never heard of it. Either they were asleep in Egypt or busy herding and enslaving in Abyssinia! Or, it did not fit their narrative and was thus not considered worth mentioning.